A man who killed a couple saying he thought he was piloting the Starship Enterprise at the time has been found not guilty by reason of insanity. Matthew Kelliher, 31, was being pursued by police when he crashed in Tilehurst Road, Reading, on 27 January, killing Duncan and Annelise Storrar. He was cleared of causing their deaths by dangerous driving but detained under the Mental Health Act. He had been assessed at a psychiatric hospital on the day of the crash. However, he was not admitted. An inquiry is under way. Reading Crown Court had heard that Mr Kelliher thought he was driving the Starship Enterprise at 6,000mph when he hit the married couple's car. 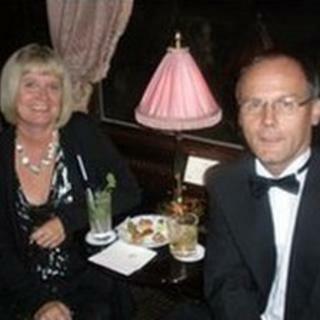 Mr Storrar, 54, and his wife, 49, who had been to the cinema, died instantly when their vehicle burst into flames. Shortly before the chase, Mr Kelliher, of Brunswick Street, Reading, had got out of his car to try to command traffic lights to change from red to green when a police car came towards, the court heard. Jurors heard he then jumped a red light and was being pursued by the marked car with its lights and sirens sounding along the 30mph Tilehurst Road when it hit the couple's car from behind after a 40-second chase. Mr Kelliher, who had not been drinking or taking drugs but had a history of mental illness, was arrested and sectioned under the Mental Health Act. A jury found him not guilty of causing the deaths on the grounds of insanity. The court heard that he suffered from an acute polymorphic psychotic disorder. Berkshire Healthcare NHS Foundation Trust said it had started an investigation after it was revealed Mr Kelliher had visited Prospect Park Hospital on the day of the crash but not admitted. In a statement the trust said: "We will be conducting a robust and thorough joint investigation with our social services colleagues regarding this tragic event and it would be inappropriate to comment until the investigation is complete."